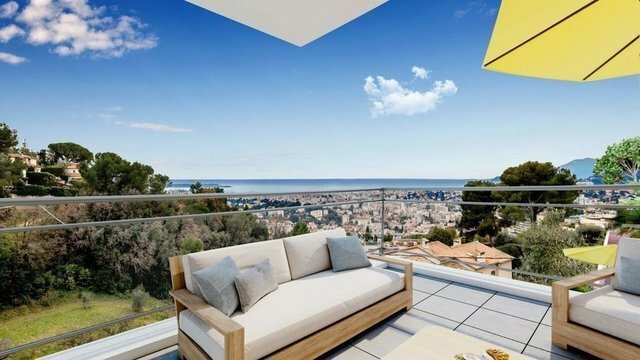 EXCLUSIVITYIdeally located on a real belvedere with panoramic views over the bay of Cannes, the Lerins islands and the Esterel mountains, in the heart of lush vegetation with an authentic preserved olive grove, will be erected a very high standing and exclusive gated estate. Composed of contemporary buildings spread over two levels only, this prestigious residence will be completed with two superb swimming pools.This 155 sq. m.2 bedroom apartment will be composed as follows :Entrance hallLarge living-dining room with open plan kitchen of about 60 sq. m. One bedroom with en suite bathroom and dressing Three further bedrooms, one shower-room and one bathroom.Guest toiletThe apartment will benefit from two balconies and two beautiful terraces facing the sea.Two garages in the basement including one double.Possibility of acquiring additional garages.Floor plans and more information upon request The delivery of the estate is scheduled for June 2021.Reduced notary fees.